As a hi-tech company (Certification No.GR201411003176) focusing on R&D of solid state laser and related application products, JOYEE has gained rich experience on product engineering through the procedure of longtime research and promotion on laser products. 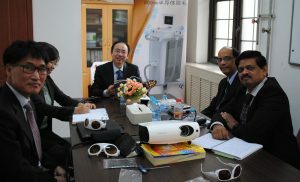 JOYEE has not only provided the science laser for famous university, such as Peking University, Tsinghua University, Shanghai Jiao Tong University, and research institutes, such as Institute of Mechanics (IM) of the Chinese Academy of Sciences (CAS), Shanghai Institute of Optics and Fine Mechanics (SIOM) of the CAS, Beijing Aeronautical Manufacturing Technology Research Institute, but also provided the ODM/OEM solution for medical laser suppliers in Switzerland, Holland, Korea and Thailand. has built a high efficient team which insist on innovation, face to challenges and targeting on our duty to improve the technical content and product quality from China. According our international perspective and the service ability of global response, efforts to provide customers with cost-effective laser application products. We have reseller and distributor on Switzerland, Germany, Holland, Japan, Thailand and Bolivia, and sold the products over 30 countries, such as United States of America, United Kingdom, Germany, Switzerland, Holland, Japan, Korea, Australia, India…etc The performance and quality of products obtained continue recognition and trust from customers. We believing: win with customer is the only value of JOYEE. We hope to create the beautiful future with you together!